With the first month of 2017 almost behind us and spring merchandise arriving on the racks of your favorite stores, it's time to think about the must-have fashion trends of 2017. But before we do that, let's quickly review some noteworthy trends from 2016, including: off-the shoulder silhouettes, '90s denim, block heel boots, lace-up details, stylish sportswear, pom pom embellishments, and bomber jackets. I wouldn't totally stash away these items, because as we progress into the new year, many of them will remain on the trend cycle. Based on runway, retail, social media, and trade show research, here are the nine top trends to make room in your closet for in 2017. Statement sleeves are evolving form the simple bell sleeve and are getting new treatments such as tiers, cut outs, and ties. Utilitarian jackets get a feminine update with floral embroidery, while denim and footwear undergo a refresh with Gucci-inspired embellishments. 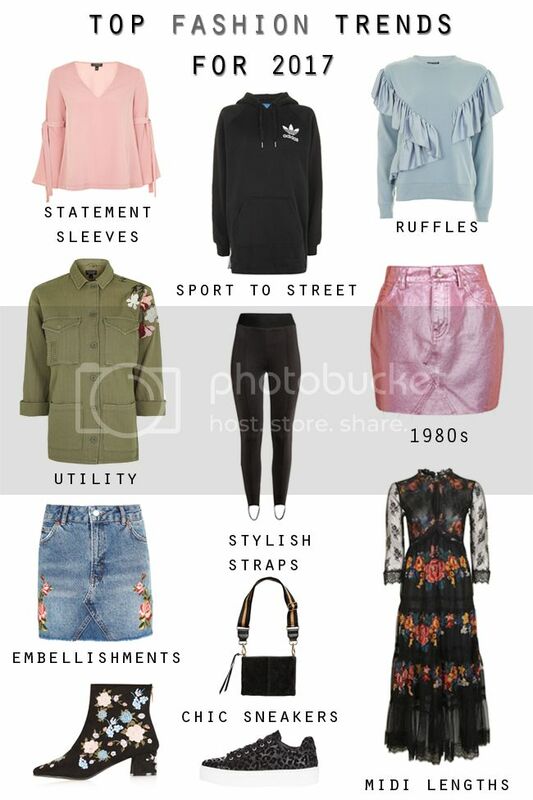 Athleisure, perhaps one of the most ubiquitous words in fashion right now, will gain steam as casual, sporty styles incorporate fashionable design elements. Look to Adidas, Vetements, Puma, and Off-White c/o Virgil Abloh for sporty cues. Handbags get updated with guitar-style straps thanks to Prada, while ruffles adorn everything from casual blouses to flirty skirts. Look to the '80s to return in full force this spring, while midi hemlines continue to take center stage. Want to see more trend reports? Have a look at my feature on top denim trends for 2017, a spring/summer 2017 fashion trend forecast, and a fall 2017/winter 2018 fashion trend forecast. February 27, 2017 update - See top footwear trends for 2017 in my trade show report covering top brands Schutz, Carrano, GuiltySoles, Shellys London, and more. Follow along on social media @thekeytochic for more photos, retail reports, and exclusive content.